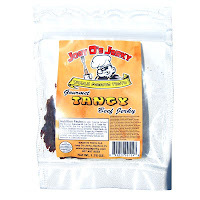 Next in the series on Joey D's Jerky is this Tangy variety. See my previous reviews of their Original, Teriyaki, and Hot varities. Joey D's Jerky is owned by DiSalvo Enterprises, Inc. based out of Sanford, FL, run by Joseph DiSalvo, who got started making beef jerky at home back in 1999. He would challenge his friends at beef jerky making contests, and his friends were always impressed with his creations, that he felt encouraged to make a business out of it. Joey D's Jerk officially went on the market in August 2008. 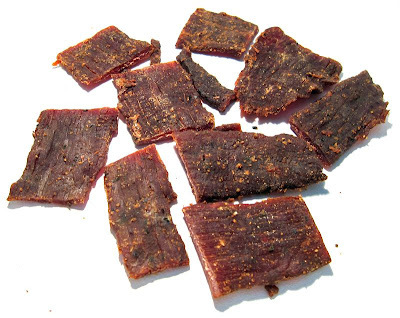 Joey's D's includes four varieties of jerky, this Tangy, as well as a Hot, a Teriyaki, and an Original. It also include three varieties of salsas. Beef, barbecue sauce, soy sauce, teriyaki sauce, worcestershire sauce, brown sugar, flavorings. The first thing I taste from the surface of these pieces is a light sweet and a light salty flavor. I can taste a little bit of the barbecue sauce, along with some worcestershire. In the chewing flavors, the barbecue sauce seems to take on more definition, as well as the worcestershire. I can taste just a light bit of natural meat flavors. For being dubbed a "Tangy" variety, it does seem to have some of that tanginess coming from the barbecue sauce. That is, the barbecue sauce itself is tangy, and it seems to come through enough that I think it's fair to say this jerky lives up to that billing. It's not a strong tangy flavor, but there's enough of it there that I can easily notice it. The barbecue sauce ingredient as a whole doesn't really come out as a dominant flavor, though it too is noticeable. It's light, and provides a touch of flavor overall. Otherwise, the flavor that seems make itself known more than anything is that combination of soy sauce and worcestershire, or as I described as a "saucy" flavor in the Original variety. This Tangy variety seems to have a more identifiable worcestershire than the soy sauce. The natural meat flavors are only slightly noticeable. There's a little bit of a peppery aftertaste. The salt intensity in this seems moderate. Overall, what you're going to notice in this is largely the "saucy" flavor combo of soy sauce and worcestershire, with a touch of barbecue sauce. It does seem to live up to its billing as a "tangy" beef jerky, largely due to the tangy nature of barbecue sauce. These appear to be slices of whole meat, sliced medium to thick thickness, and in bite sized pieces. It's a semi-moist jerky, being rather soft and tender to chew. Tearing a piece apart with my fingers is very easy, and chewing is also very easy. The chewing texture starts out feeling soft and moist, and breaks apart quite easily with just a little bit of sucking and light biting. Once it's chewed down to a soft mass, it has a little bit of a steak-like chewing texture, but seems to be more crumbly than anything. I didn't find any visible signs of fat, and no tendon or gristle, and no stringy sinews. It's all pretty lean jerky. In terms of clean eating, it seemed to be pretty clean. My fingers didn't pick up much any residue. I didn't find any bit of meat falling on my lap or desk, largely due to the bite-sizes. Joey D's Jerky sells this Original variety from its website at a price of $6.00 for a 3.5oz package. If you bought four packages, it'll cost $24.00, plus shipping of $6.00, the total price runs $30.00. That works out to a per ounce price of $2.14. For general jerky snacking purposes, at this $2.14 price per ounce, it seems to provide a decent value. I was able to get a good deal of snackability for its overall good flavor, and easy eating, though I found a lackluster chewing texture. The price of $2.14 per ounce is higher than what you'd pay for mass-market jerky at the grocery store, but I think you'll get more snackability with this than those brands. As a Tangy variety, at the same $2.14 price per ounce, it seems to provide a fair value. I do pick up a tangy flavor, though it's not a strong tanginess, but still easily recognizable. This jerky still mostly comes off as a soy sauce/worcestershire jerky, pushing that tanginess aside. 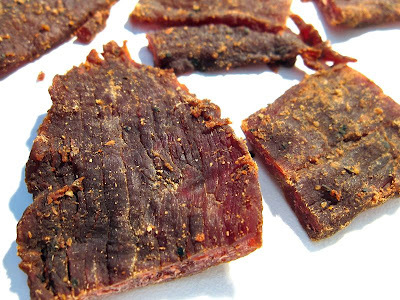 This Tangy variety from Joey D's Jerky does indeed provide a tangy flavor, though not a strong tanginess. It seems to stem from the barbecue sauce ingredient. Overall it provides a good flavor, mostly coming from the combination of soy sauce and worcestershire, with the worcestershire having a little more definition. The addition of barbecue sauce builds on top of it, adding an extra flavor dimension, though this jerky still seems to be identified by that soy sauce/worcestershire combo. Perhaps a more tangier barbecue sauce could punch out that tanginess even more. The meat consistency being semi-moist is easy to chew, and the pieces being bite-sized adds to the snackability. But the chewing texture is largely crumbly, which is consistent with Joey D's other varieties. My recommended beer pairing for this is a smoky porter.